Back in September/October I made my first “real” Houppelande (see pic in my earlier posts). It was made using a slightly modified version of Cynthia Virtue’s excellent “rotated-corner, circle plan houppelande” which can be seen here http://www.virtue.to/articles/circle_houp.html. The modification: I create the shoulder line using her method – but I don’t fill in the back of the neck using a gore – I joined the seam the entire way then cut a neck hole. I say “real” because last year I made a “rain” houppelande (same pattern – different sleeve) out of water proof material for Pennsic – along with a PVC vinyl rain hennin 😀 (it’s hilarious and looks awesome – if I do say so myself!) Nothing like sweeping along through the mud with a full train! The Sept/Oct one is a full circle out of 10 yards of a light-ish weight Jacquard wool. The layout was tight to say the least – I achieved it by piecing the fabric together in a fairly non-modern sort of way. I was pleased with the result and there was practically NO wasted fabric at all. It’s fully lined with silk and linen (linen up near the body – silk in the sleeves and closer to the hem). I do love it but…it’s not the most convenient to wear. It weighs about a TON (well, ok…more like 12 pounds). It actually makes my shoulders ache after a while. I think a full circle really is *too* full. I suspect many houppelandes were not made like this. 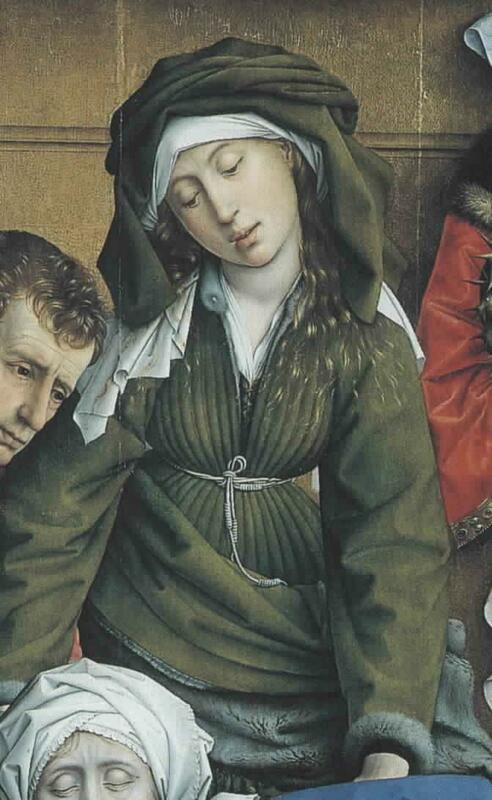 Some of my favs in the 15th century French illustrated Decameron and in paintings look like less fabric to me. I would like one that I can wear on cold nights at Pennsic and at 12th Night this year which will have outdoor activities. 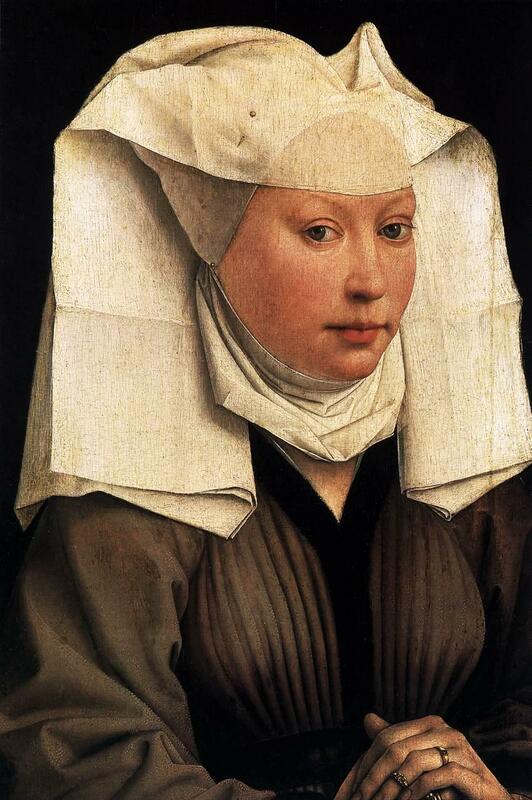 I like the look of a Houppelande better than a cloak for 15th century since there are far fewer cloaks shown in paintings or illuminations from the period, and those few I’ve seen appear to be on servants. For Pennsic and 12th Night, though, it needs to be *relatively* practical. Which brings us to…. And another - I love this lady - and her headdress. There are a couple of good examples of this type done by other re-enactors including: http://www.gelfling.dds.nl/houppelande.html and http://cadieux.mediumaevum.com/myhouppelande.html (although I don’t agree with all of the construction methods used by Ms. Cadieux , such as padding the pleats (which I think she too decided in the end wasn’t plausible). Pattern: Rotated-corner half circle plan. Based on Cynthia’s method but instead of a full circle – this will be a half. With the bulk of the fur I really don’t think it needs (nor do I want) any more fullness. It will not be cut like modern swing coat patterns which waste too much fabric. I will cut two quarter circles; the edges will form the front and back seams. The sleeve will be a rectangle. The back will be filled in with a gore. Believe it or not – using this layout – you can get the whole thing out of 4.5 yards of 60” width fabric IF you are 5.5’ or shorter. If you are taller like me you will have to add on some fabric to the width so that the front seam is long enough. Here’s the pattern and layout (click it for a clearer view of my notes). 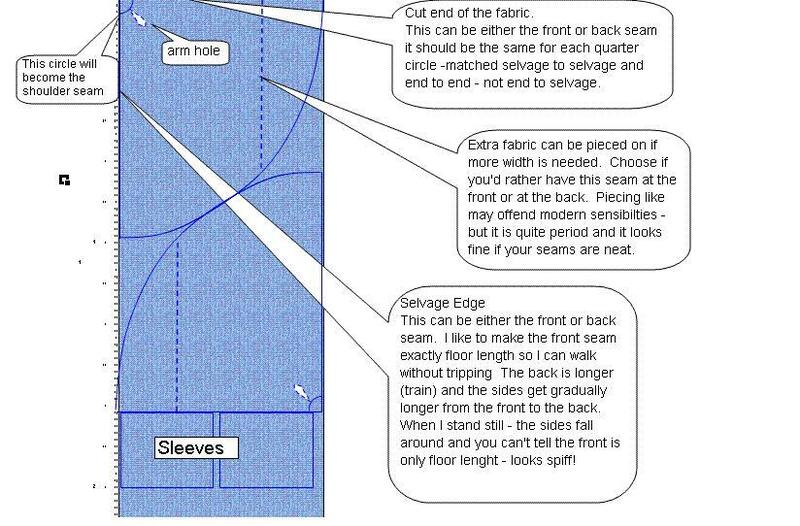 IMPORTANT NOTE: this assumes your fabric is pretty much the same on the “good” side and “wrong” side. If not, please don’t use this layout. 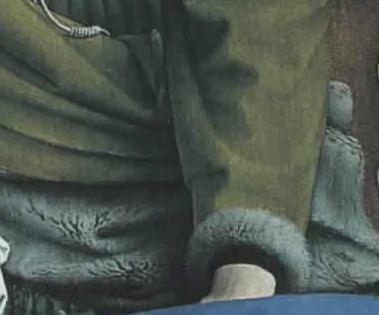 The Materials: Faux Fur and Green Wool. 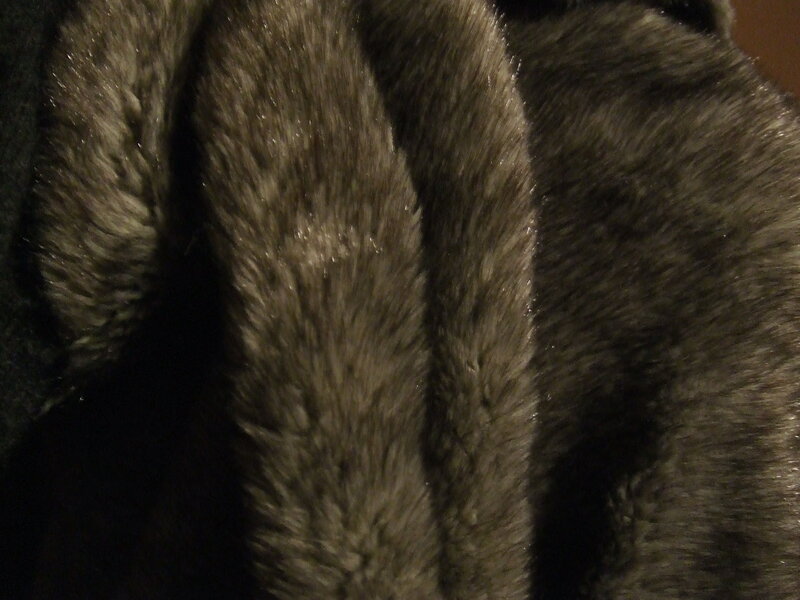 I have been buying up various remnants of good faux fur when I see it. I have enough now for this if I use two different pieces (they match in colour but not texture). I will use one kind for the body and the other for the sleeves and neck edge (maybe). I’m pretty pleased with the look of one to be used for the body – it reminds me of fur from one of the Vander Weyden paintings (as seen here on the right). I’m sure I’ll regret this and obsess over it endlessly but for once I’ve given myself permission to be lazy. I thought about cutting the fur into pelt-sized pieces and then sewing them back together for a more authentic look, but, life is just too short and there are so many other projects to work on. It’s getting cut out of one piece – so there! Um….I’m just a really good furrier…you can’t even tell it’s different pelts *wink*.